About 80 minutes north of Milwaukee, Wisconsin sits Manitowoc, a city known for a Maritime Museum, a car ferry, and where a piece of the Soviet Sputnik 4 fell out of the sky in 1962. It is also where I grew up until I joined the Navy in 1981. These photos were taken in July of 2011 with a Canon EOS Rebel XSi and the stock 18-55 kit lens that came with the camera (it was all I owned). I still use a kit lens and found they do a decent job as an all-purpose lens. Recently, after making the decision to not sell mine, I read Andrew S. Gibson’s article entitled Why your Kit Lens is Better than You Think, it made me feel good about the decision. The above photo, The North Pier, was taken during the photographer’s “golden hour” as was the photo at the bottom of the page. A major tourist destination in Manitowoc is the Wisconsin Maritime Museum. The centerpiece of the museum is a World War Two submarine, the USS Cobia (SS-245). The Cobia came to Manitowoc in the early 1970’s and has been restored to an incredible condition. I’ve seen other WWII subs on display and don’t know of any in as good of condition. In fact, Cobia’s engines still run and are started on occasion, click here for a video. When I go home, I usually squeeze in a trip to the museum and the Cobia. At right is a photo I took of Cobia one morning on a walk. Many tourists arrive and depart Manitowoc on the SS Badger car ferry. The Badger travels about sixty miles to Ludington, Michican; by car this trip is over 400 miles! 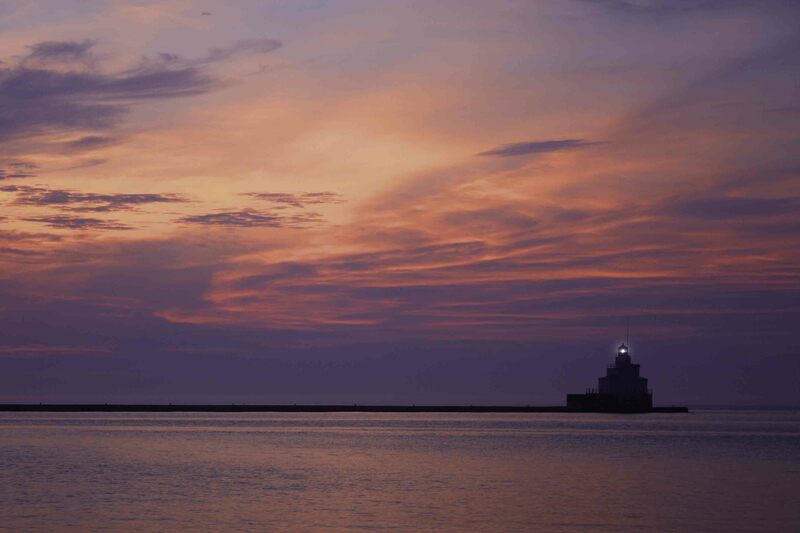 Manitowoc has a rich maritime history and car ferries once played a key role connecting this Lake Michigan town to major cities such as Milwaukee and Chicago. Both of these photos (left & above) are black and white photos with color accents. Next week’s blog is devoted to these types of photos. This photo, called Home… was also taken in July of 2011 This is the old mill at Manitowoc Rapids located northwest of Manitowoc. Also here is an old truss bridge from 1887 when this road was the major highway connecting Milwaukee and Green Bay. Nearby is the grave of a prominent Native American named Chief Mexico. Mexico was Chief of the Chippewa, Ottawa, and Menominee tribes of Manitowoc County; he died and was buried here in 1844. The old mill, truss bridge, and Chief Mexico’s grave are about a five minute walk from each other. I’m already planning my future trip home and may take the Badger to Ludington, film a sunset along with Ludington’s lighthouse, and come home the next day. Also on the agenda is to film the lighthouses of Manitowoc County. If I’m feeling ambitious, I’ll go in winter. You forgot who made MANITOWOC a household name. MANITOWOC ice makers baby. Best ice maker in the market and I sell parts for them. Just thought I’d interject that little piece of information. Beautiful pics and city. Yes, indeed! I see those machines in practically every hotel and restaurant in the country. Also, I didn’t mention Manitowoc Cranes and Burger Boat Co….